I had very low expectations of Chennai Express, mostly due to Rohit Shetty’s idea of humour. I expected something along the lines of “a typical filmi Rahul type wanders into a Tamil film. Hijinks ensue.” And that is what I got. 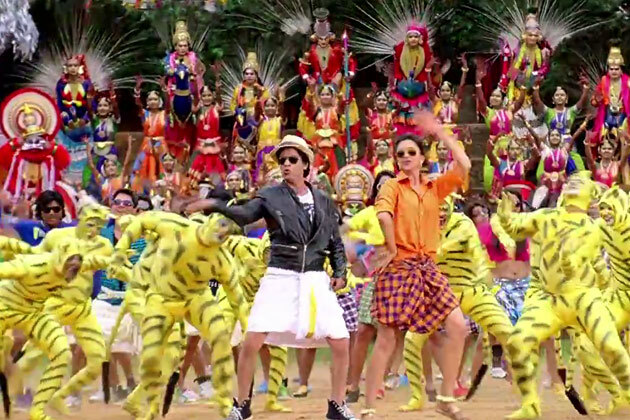 Not entirely successful, but amusing enough with loads of colour and movement, Chennai Express is a good timepass. Shah Rukh plays this Rahul as an anti-Rahul. Where the KKKG model Rahul would have made his grandfather’s last wish a priority, this one tries to skive off. Rahul has lived in comfort all of his 40 years and yet feels no obligation to family. He is an unappealing manchild clearly in need of a wakeup call. A series of misadventures see him trapped on the Chennai Express, headed straight for a showdown with a Tamil don and his family. Shah Rukh has no qualms about making Rahul a shallow idiot to start with and there is an air of self-parody about some of his preening and posing. I particularly liked the sly humour when Meenamma (Deepika Padukone) guesses he must be 50, or maybe even older. Shah Rukh does all his familiar shtick from hair ruffling, décolletage sniffing (you know the move), arm flinging, to the eyes welling with tears. Of course it wouldn’t be an SRK film without a far too long speech about some social issue. While I appreciated the content (women should be able to make choices for themselves) it was rather undermined by the context (blokes beating each other to a pulp so Rahul might win the right to give Meena her choice). Shah Rukh isn’t perfect, and he does ham wildly at times but he also has the courage to show off those spindly legs in a lungi. Deepika gives one of her better performances as Meenamma (leaving aside her much criticised accent which didn’t bother me that much). From her DDLJ style entry (and one of the funnier scenes that ensued) and her cheerful explanation that her father (the excellent Sathyaraj) is a renowned don, Meenamma made an impression. Deepika always looks pretty but often fails to convey chemistry with her co-stars. She seems to have overcome that as her scenes with Shah Rukh are lively, often fun and even moving. She has worked on her dancing too and appeared to good effect in the big production numbers. And her wardrobe was just lovely although I’m not sure where all the sarees kept coming from. Generous village ladies I guess. Initially dismissive of each other, there is no insta-love. Their relationship develops through forced proximity and dealing with external threats. A series of events open each character’s eyes to their feelings and the triggers for these changes make sense within the story. Meena is the first to fall but she has reservations about Rahul and isn’t overcome by silliness just because her heart flutters. The romance works for me as it isn’t the primary motivation from the start, despite Rahul’s pathetic flirting. As I expected, the comedy is often too broad and overplayed for my tastes. But there were some wittier scenes that I really liked. Rahul and Meenamma communicate in front of their abductors by singing in Hindi to Bollywood songs, many from SRK films. When Meena finds out Rahul is a mithaiwala or tries to guess his age, Deepika’s reactions seemed spontaneous and very funny. But it is hit and miss. Heather found several things funny that I would edit out (e.g. Meenamma’s ‘nightmare’) and other audience members were just about wetting themselves in scenes that had me checking my watch. I liked the product placements that were often done in tongue-in-cheek style. There is a lot of chatter about the South Indian stereotypes portrayed. Well, there is just about every stereotype present and the North Indians were less than perfect. Rahul was arrogant, ignorant and not really interested in Tamil culture, assuming people were quaint caricatures or savages. The Tamil rowdies were played by the guys who play Tamil rowdies in almost every film; swarthy, stocky and spiral permed as always. The ‘other’ South stereotypes also appeared – salt of the earth villagers with hearts of gold. There was even a comedy Punjabi policeman. No one was safe. Maybe it is just that years of watching Indian film portrayals of fat people, coloured people, white people, disabled people, what was the other one … oh yes, women, has eroded my sensibilities. Rohit Shetty gave some standards his own fun twist too – like trading a convoy of white Sumos for a fleet of colourful 4WDs. The supporting cast are largely playing the same roles they play in their own film industry so that was fun to see. Nikitin Dheer was perfectly fine as Meenamma’s unwanted prospective groom but I couldn’t help wishing they cast favourite “That Guy” Subbaraju. Maybe he refused on the grounds that singing Chamak Challo would be bad for his image. Hooray for item numbers! Priyamani and her back up dudes were fantastic. I especially liked the enthusiasm of the guy in the yellow scarf who appears between SRK and Priyamani and the guy in the stripey mesh singlet. Who cares if the song lyrics are stupid? Vishal-Shekhar had me wanting to hit replay and dance! SRK struggling to keep up with the chunky backing dancers and looking like a fish out of water may not have been intentional but it suited Rahul. He looks happy and absolutely knackered in the behind the scenes bits in that clip. The other songs were visually extravagant and included all the other SI film staples that couldn’t fit in the narrative. The much vaunted tribute to Rajinikanth is a dud. While Rajini is not much of a dancer, there was little of his style in the number. The fight scenes and car stunts are what I’d expect from a Hindi director with a big budget and a couple of Tamil DVDs on the coffee table; spectacular but a bit slower and more laboured than if this was a real South film. And like many South Indian films, this is visually gorgeous. 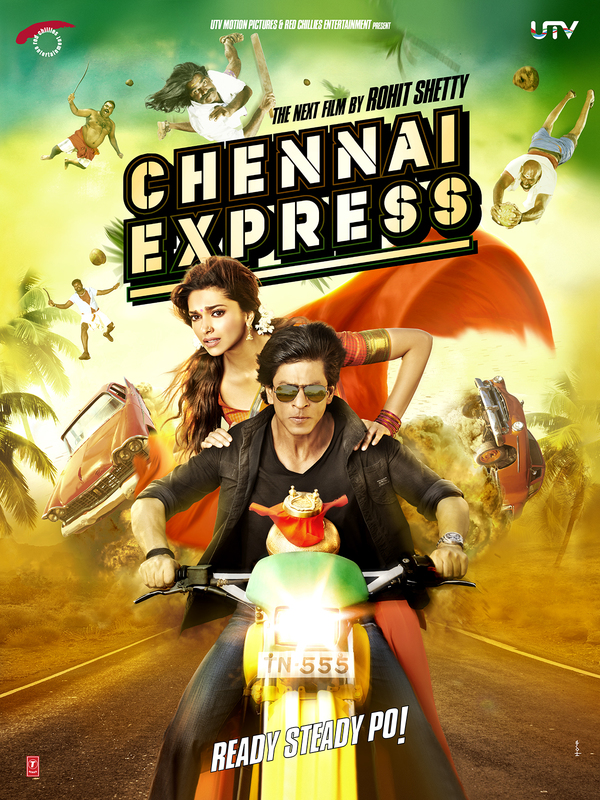 I liked more than I disliked about Chennai Express, but apart from the songs I don’t think I would watch it again. Despite all the Tamil references, this reminds me more of a Telugu film as – spoiler – no one is raped and there are lots of survivors at the end. Worth a watch, more so if you’re a Shah Rukh fan. Heather says: I also had really low expectations for this film which is possibly why I enjoyed Chennai Express as much as I did. 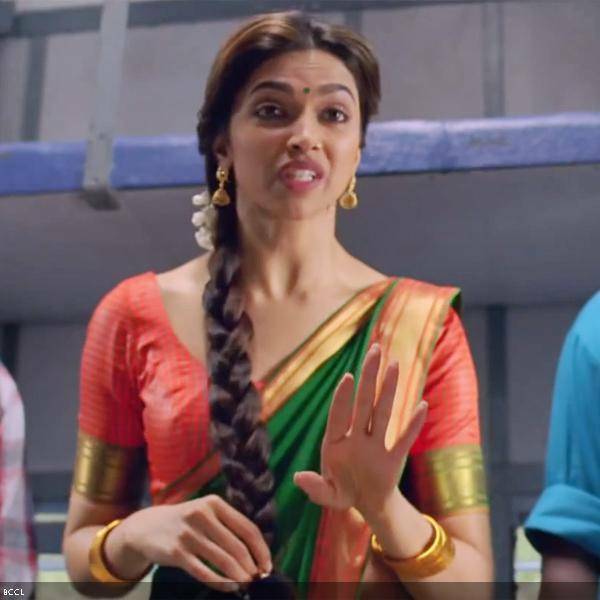 For a change I even liked Deepika and I thought she did particularly well in the comedy scenes. Perhaps it’s only when she appears opposite Shah Rukh that she actually manages to act. I also laughed much more than I was expecting – after all I don’t think I’ve been amused by a Rohit Shetty film before either. Chennai Express is really very funny, despite the humour mostly being very broad and largely based on various caricatures. However as Temple mentions, there was some more subtle humour and the references to many older films were witty and often poked fun at SRK more than at any particular stereotype. I enjoyed the music and dancing more on screen too, since I hadn’t been terribly impressed with the soundtrack on first listening. The highlight was definitely Priyamani and watching Shah Rukh trying to keep up, but most of the songs were well pictured and enjoyable. Any song is always much better with the addition of elephants in my opinion! Overall the film looks beautiful, although it really could have been almost anywhere in the south and only the language placed the film in Tamil Nadu. Chennai Express is not one of my favourite Shah Rukh Khan films, but definitely not his worst, and there are a few scenes I would like to watch again. Not the lungi dance tribute to Rajni over the end credits though – I’d recommend leaving when the credits start to roll! This entry was posted in Bollywood and tagged Bollywood, Chennai Express, Deepika Padukone, Hindi, Nikitin Dheer, Rohit Shetty, Sathyaraj, Shah Rukh Khan, SRK, Vishal-Shekhar. Bookmark the permalink. Hi Pulkita 🙂 Totally different audience reaction here to the Lungi Dance I’m afraid. Most of the audience were on their feet – walking out as soon as the song started! It’s a habit that drives me nuts as if nothing else I like to read the end credits. I got the impression that most of the Indian audience didn’t really get all the Southern film references and tributes in the movie so maybe they only had a vague idea of Rajini from Endhiran/Robot. The session we went to was about half full but the one after ours was selling out so may have been a more enthusiastic crowd. Glad you enjoyed it! Thanks 🙂 Have you seen the movie yet? Watched it – really liked it – loved the songs already but had only seen 1234 on vid till yesterday …..loved the picturisation of the songs (even the last one) – was disappointed Ready Steady Po wasn’t in it. Deepika wasn’t as annoying as I thought she was going to be as tamil accent wasn’t there most of the time. Make up person needs more training as I could see at times that his face wasn’t blended into neck. Last fight scene was great – reminded me of Baazigar days…he looks great covered in blood. Was the usual collection of PJs that Rohit Shetty specialises in. SRK is more than bearable when he is spoofing himself, and Deepika I thought exceeded expectations. That she looks really good and could carry off her comedy bits didn’t hurt. It was still a collection of Northie/Southie stereotypes… disappointed that we are still in the Padosan mould, though maybe not so offensive after all these years. After a long time, I watched a bollywood movie to the end! At first, I refused to go to the movie since I can’t stand SRK. Since, “Attagarintiki daaredi” didn’t release through whole of August, this was the remaining choice. Surprisingly, I was able to stand both SRK and Deepika in this. The sarees and vonis (the half-sarees by Meenamma in the DDLJ train scene in screen cap above) are so gorgeous, I wish it would start a “voni” trend like chudidhar trend after Maine Pyaar Kiya. I thought it was cute that there are a lot of South Indian movie reference scenes too even if they are somewhat forced (nightmare by Meenamma as reference to Chandramukhi). I had exact thought as Temple as to how Meenamma kept getting so many awesome sarees. But then, it was “wedding” week in village and it is plausible to share clothing & jewelry among guests. Perhaps Meenamma shared her wedding jewels in exchange for clothes. I loved “kaafee” (enough in Hindi) to “coffee” (quintessential Tamil thing) scene and the double meaning of “can speak hindi”, used by smuggler saying “see, “Hindi”. I spoke ‘Hindi’ too”. (Reminded me LoTR, “Speak friend and enter”). Hi Violet. Congratulations on your double achievement of a) tolerating a cast you don’t like and b) watching the whole thing before judging it. Hurrah! I really was expecting the South references to be more of a put-down or joke so I was pleasantly surprised by the way the humour was largely turned on SRK or on ignorance in general. As you say, not all the references worked seamlessly but it did largely come across as being in the spirit of a tribute to some iconic moments and filmi style. And as someone who regularly mangles a tiny Hindi vocabulary and a practically non-existent Tamil one, I agree the language/puns were often very funny 🙂 I did see a few people complaining that Deepika’s character was too old to be wearing a half-saree (surely not that much older than your average Genelia or Trisha type heroine?) but I thought she looked lovely regardless. Now that you touched on age relation with half-saree, I had one more observation during the movie. Half-saree is typically a traditional teenager/unmarried girl dress. Although, a girl is supposed to behave grown-up, this still allows for free movement of running and climbing trees. It is also used in movies to depict an unmarried girl if the heroine in question doesn’t obviously look young enough to be a teenager. Even though single, girls switch to sarees in their early 20s to show maturity as women (in olden days that are 80s 🙂 ). So, Meenamma was a run-away immature girl in the beginning. It’s not that she doesn’t like the groom, she doesn’t like marriage at all. She is mostly in half-saree. Once her wedding occasion occurs and she runs away with SRK, she puts on Saree. (Although given her story that she is married to SRK, she would be offered sarees instead of half-sarees). When SRK leaves by himself and when she comes back to her home again, she is in half-saree. A run-away immature mode instead of ready to face her father maturity. Sorry for the long comment. I thought that the clothes thing was interesting since I was distracted them being running around with a single backpack. PS – Oh even I was wondering about the temple and the Saivites and at first thought I must have misidentified Lord Balaji – I came home and checked after the movie.